"In Wisconsin, brats are considered a staple at summer picnics. These are a twist on the traditional grilled brats. I have found once people try them, they soon become a favorite." Place the brats into the bottom of a large electric covered roaster (such as a Nesco(R)). Layer the apples, then the onions, then the brown sugar over the brats. Pour the water over the ingredients. Cover the roaster and cook the brats at 325 degrees F (165 degrees C) for 3 hours. Brats will look dark and candied when ready. Nothing beats bacon-wrapped sausages on a stick! Good. 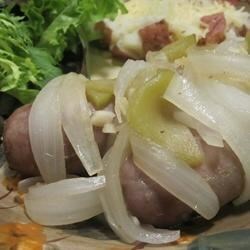 A different way to prepare brats. We have them quite often in Wisconsin!